After being picked up at the most convenient location to your hotel around 08.00, you start your 30 minute joumey along the Sorrentine Peninsula to get to Pompeii, one of the most famous archaeological sites in the world. You will be guided through the ancient streets of Pompei to see the amphitheatre, baths, forums, homes, shops and villas built by the prosperous Romans with fabulously preserved frescos which adorn the walls and floors. After the tour of the Pompeii you will have free time for lunch before continuing to the excavations of Herculaneum where your guide will take you through this smaller but better preserved site. 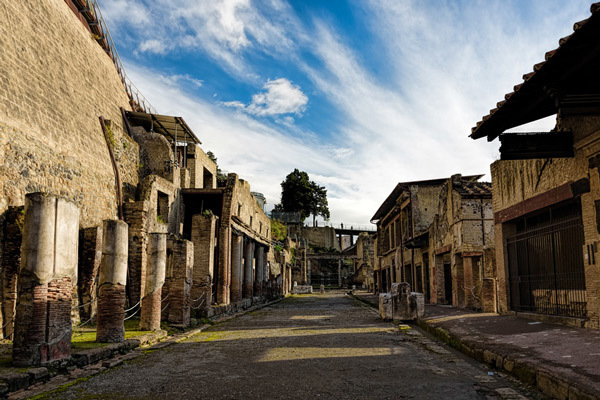 This will include Decumanus Maximus, the main street through Herculaneum reopened to the public in April 2011, after 20 years. At the end of the tour your comfortable and air conditioned coach will be waiting to take you back to Sorrento in the afternoon in time to relax by the pool with a cool drink or ice cream.